$3 million dollar Jute Mill fire at San Quentin State Prison, April 19, 1951. Photo copy from Larkspur FD Historical archives. 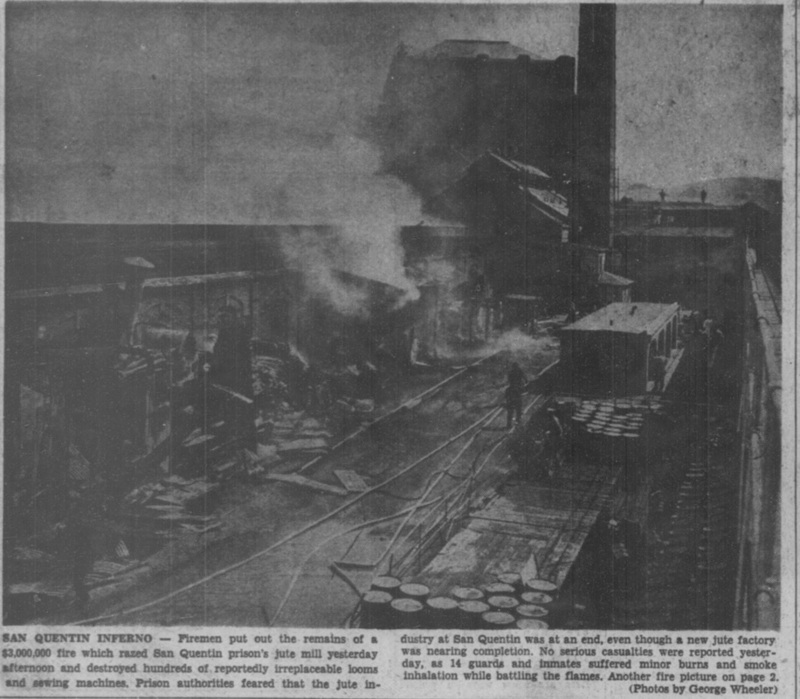 Note: See 1910 Jute Mill Fire for an explanation about Jute Mills, and this one in particular. Convict Salvador Mosqueda was 21 years old and a burglar serving time in San Quentin after being caught and tried in Santa Clara. On Thursday, April 19, about 1:00 p.m. he was working in the Jute Mill sewing section next to Ralph Nichols, a convicted robber from Los Angeles. Salvador had just finished a cigarette, and had carelessly tossed it to the floor nearby. A short time later, he noticed a small wisp of smoke coming from a nearby pile of finished sacks, all of which were destined for the war effort in Korea for use as sand bags. His initial reaction was to throw more bags on the pile, in the hope of smothering and hiding the smoke. When that did not work, he next tried to stamp on the pile. This also failed to reduce the smoke, and in a short time there were two small ‘pops’ that sounded like explosions. A larger fire quickly broke out, and spread rapidly in the 69-year old wooden structure. The alarm was sounded, and the 700 inmates filed out in an orderly fashion within five minutes. Warden Clinton T. Duffy quickly called for outside help from neighboring fire departments, knowing full well that the fire would be beyond the capabilities of the 13-inmate fire department. Within a short time there were huge, billowing clouds of black smoke that filled the sky. San Rafael, Larkspur, Corte Madera, and Marin County Fire Departments responded and fought the fire with the San Quentin crew with a total of 13 fire engines and 110 men. San Rafael FD Chief Chris Johansen directed the joint effort to extinguish the blaze. 200 additional inmates were tasked with assisting the efforts where possible. Warden Duffy would later commend the inmates for their cooperation and speed in fighting the fire, and added he believed there was no escape plot involved. With the smoke attracting crowds of onlookers, the Highway Patrol decided to close all of the roads leading to the area. The fire burned fast and hot, but was under control within an hour. Inmates fought successfully to keep the fire from an adjacent industrial building, an old wooden structure being used as a chapel and gymnasium. The main prison boiler room was also nearby, furnishing heat for the prison and hot water for the mess hall steam tables. They were not destroyed by the fire, but were out of working order until repairs could be made. A temporary boiler system was installed for use in the meantime. ​There were no deaths or serious injuries during the fire, although thirteen inmates and guards suffered relatively minor injuries. Most were described as minor burns and smoke inhalation. Guard James D. Powell, 28, was overcome by smoke at one point. Two convicts pulled him to safety. San Quentin at the time housed 4,500 convicts, but there was no evidence of rioting or disorder at any time according to authorities. Some of the inmates were said to be pleased by the loss of the Jute Mill, which was notorious for it’s noise and dust. By the next day, San Quentin authorities described the loss as amounting to roughly $3,000,000, with the “irreplaceable loss” of hundreds of looms and sewing machines that had been imported from Scotland in the 1890’s. All of this equipment had been slated to be moved later in the year to the soon-to-be finished new Jute Mill Building nearby, at that time three-quarters completed. Curiously, Warden Duffy would later reduce the financial loss to an amount of $250,000, without explanation. Warden Duffy, State Corrections Commissioner Richard McGee, and their staff led the fire cause investigation over the next few weeks. It would also result in claims that would also later change. Initially Duffy said it was caused by a dropped cigarette or spontaneous combustion, but then said it was “deliberately set.” However, the actual cause was finally described as accidental, with the details provided about Salvador’s actions. He and Nichols and one other inmate spent time in solitary confinement during the investigation. Duffy expressed pessimism as to the possibility of getting SQ’s jute mill production underway again, saying he doubted whether the prison would be able to obtain the needed machinery. The prison was working on an order for 4.5 million sand bags for Korea, when the fire wiped out the mill, and there were another 750,000 bags to be made to satisfy the contract. Sources: Independent Journal, April 20, 1951 story by Tom Wieder; California Department of Corrections and Rehabilitation Newsletter, December 4, 2014, Don Chaddock Editor; Wikipedia entries on San Quentin Prison and History; Larkspur Association of Volunteer Firefighters Historical Collection and Museum.